Pregnancy is one of the biggest things that could possibly happen in a couple’s life, so if you’re gonna tell the world, do it with a bang! 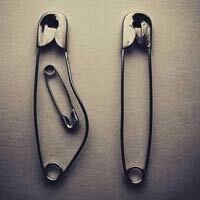 These unknown couples announced the pregnancy in a very creative way using safety pins depicting a family. Two polar bear cubs snuggle up to their mother to keep warm in temperatures reaching -50C. Photographer Andy Skillen tracked down the family at Wapusk National Park in Manitoba, Canada, following their movements for two days. Photographer and mother Angela Bosner handmade princess costumes for her daughter Haylie, then taking her to Disneyland to meet her counterparts in Fantasy-land, capturing hundreds of pictures of these magical moments.